One of the staples of documentary filmmaking is the interview. It's a useful device for providing exposition, transitions and so much more. Ken Burns's films, which are largely based around archival material, rely heavily on interviews for coherence. Errol Morris's works, use them as the main narrative - and his use of the Interrotron (a contraption designed to allow the subject to comfortably address the camera directly) provides an amazing intimacy. "The Office" (I know, it's not a real documentary), uses them to deliver joke setups and often, punch lines. 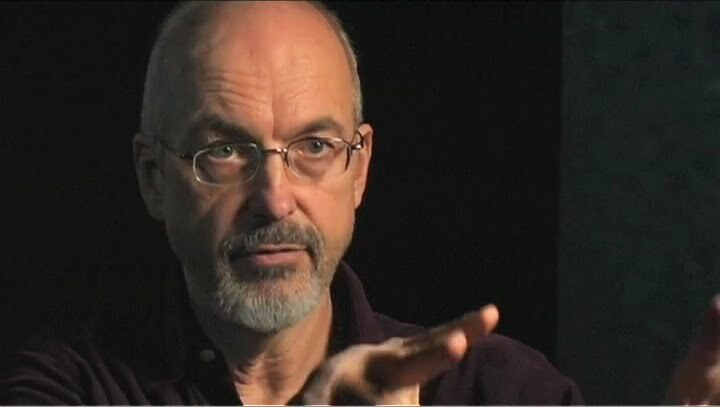 "District 9" (another fake documentary) uses them as a setup to the mystery/story at hand. However they're used, shooting interviews well is an important skill any good documentary cameraman has to master. If you look to your local news for an example of good interview shooting, stop a second, go jump in the shower (use COLD water), then dry up, come back and never do that again. The News, which is VERY dependent on interviews, does only one thing good - it delivers content quickly. The camera and lighting setups are designed to be quick. In the lamest of news interviews, the cameraperson will turn on the on-camera light, set the subject much too close to the wall and roll. The result is a nasty, flat - albeit properly-exposed - shot. Got the job done, though... delivered the content about as quickly as it's happening. The next step up is the news magazine - your "20/20" or "60 Minutes" programs. Better? Yes. Cookie cutter? Hell yes. Soft, pleasing, almost frontal key light. Add some fill to flatten the faces out. Then a hair light and edge. Then put some sort of element in the background that has something to do with the story. Usually books. Light those with some colored light. Usually blue and frequently gobo'ed. Done. Sure, this is pleasing. The subjects look nice, there's some nice modeling going on, and they're separated from their background. Sometimes this setup is the very best setup for the sake of the story, but not always and not often. 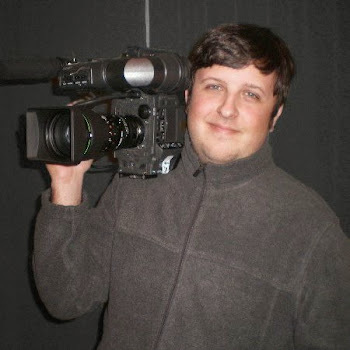 The good documentary cameraman goes into a project without preconceived ideas for how to light the interviews. Different projects will call for different styles. Sometimes, there's a look to the piece. 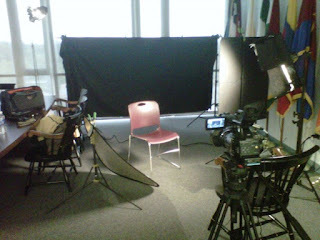 Perhaps all the interviews need to be dramatic and contrasty, or maybe they need to look natural or bright or whatever. Sometimes, there are protagonists and antagonists (like in fiction), and the good guys should be more modeled and bright, and the bad guys, more low-key. It depends on the film. Here's a piece I shot recently for Philip Dolin of Particle Productions/Circle Terrific Media. It's almost a narrative of interviews. I'm quite pleased with how they came out. For this piece, Philip and I decided that all of the interviews needed to be bright and pretty but of course, throughout it all, not flat or over-lit. My approach to the lighting was to make all non-key lighting elements subtle and based on reality. That is, I was never going to just setup a kicker and work in a hard edge for the hell of it. I wasn't going to just throw a light up on the background. It's got to flow. See below for an example. In this setup, the subject, Joy Levitt, is somewhat of an academic and the bookcases were something the producer definitely wanted to include. The room was DARK. I started with a large key, a 4 bank fluorescent through a 40" square diffusion frame. I used an unbleached muslin bounce for a warm, soft fill. For the rear bookcase, I bounced a small 250w fixture off of the column you see in the shot. It was a nice, soft, subtle illumination that gave me what I wanted without drawing attention to itself. Lastly, I knew I needed further separation for the subject so I added an edge light. My first choice for an edge is always a bounced one. It's much more subtle a touch. Typically, it's a small gold/silver stipple flexfill reflecting the key. In this particular situation, having such a soft key with limited throw (positioned high to avoid reflections in the subject's glasses), I had to do something a little different. My edge for this shot was another 250w fixture shot into a 22" white flexfill, bounced back onto the subject. You can see how nicely it plays over the subject, separating her from the background in a nice, subtle way. 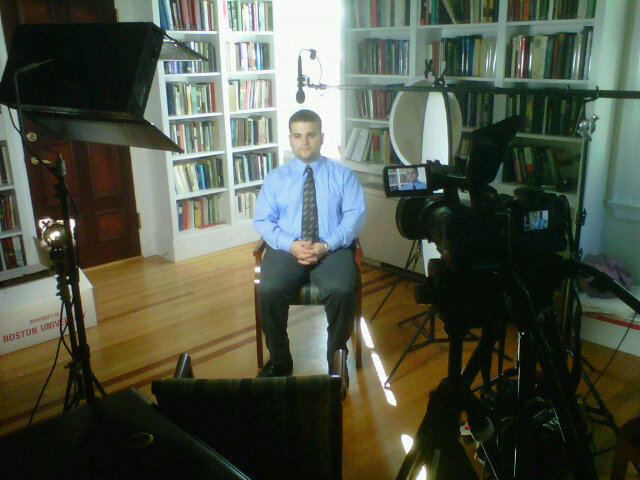 Another example of my favorite setup for a natural-looking interview setup can be seen in this grab from our interview with Elie Wiesel. Simple key from the fluorescent, bounce fill and bounce edge. As you can see in the still, it's modeled, all the necessary separation is there, but it doesn't look "lit." In my opinion, that's the best lighting - when the technical work doesn't draw attention to itself and lets the subject matter take the leading role. You can view the setup in the still below (featuring my frequent collaborated, sound mixer Bret Scheinfeld). So all this lighting stuff is well and good when you've actually got lights and power, but what about outside? On a project with a large budget, I'd bring on some big HMIs and a load of grip (and a big crew to help manage it all). In doc work, though, we're often working on as small a budget as possible. So what if it's just you and natural light? Well, there's a way for that, too. A good example of that from this specific piece with Philip was our interview with Mia Farrow at her home. As you can see, the modeled lighting present in the rest of the interviews certainly carries over, even though I was working with just the sun. The first step is deciding how to use the sun. Diffuse it and use it as a key? Sometimes, that's the best way to go. For Ms. Farrow, though, I decided the best use for the light as we had it was as a backlight (which also let me shoot the direction you see with the very nice background). For Ms. Farrow's key, I used a large white flexfill to bounce the sun back on the far side and then used my trusty unbleached muslin flexfill for some fill. And that was it. As you can see, it looks natural and Ms. Farrow looks good. So you've got the lighting aspect down. Great! Now what? It's a shame, but so many up-and-coming camerapeople tend to light their subjects beautifully in front of boring or oddly-composed backgrounds. Blank walls of various colors, weird architectural lines, or dead on flat with some sort of background element... Yuck. Us doc guys are usually stuck with whatever space we're thrown into. No production designer, no set dresser, nothing. We have to be able to look at a space cinematically and find the one great angle in an otherwise-crappy location (there is always one somewhere). Find interesting lines and use them well. Take this grab below, of our interview with NY Times columnist, Nicholas Kristoff. Look at the lines in the background. This is an example of using lines in your composition. The floor, the walls, the vertical windows are getting smaller and smaller. They lead your eye to Nick. What if we had left our cameras where they were, but flipped nick and the lighting setup. Well, A) the key light is less motivated, but B) the lines don't lead anywhere. They're just there. They don't do anything. Beyond lines, you should also look at elements. As mentioned with the interview with Joy Levitt, the bookcases were an important element of the shot (and by the way, the lines also work to our advantage in that shot). Sometimes in the "20/20" stuff, it's a flag or a poster or some other prop. 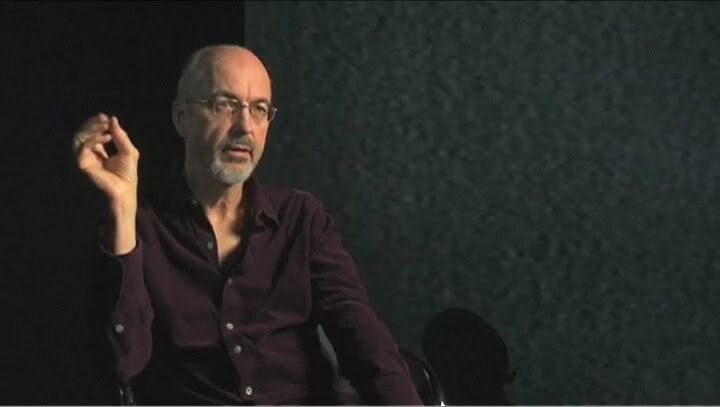 My favorite personal use of relevant background elements is in an interview I shot with video artist, Bill Viola. This was for a short documentary on an installation of his. The piece was a deeply personal expression for Bill, an exploration of memory and the subconscious. I suggested to the producer that we integrate him into the piece for the interview. As you can see, we incorporated part of a screen into the shot. Even moreso, though, I positioned him in such a way that the actual projection would play over the fill side of Bill's face. His key side is exposed properly and modeled and I bounced some back for an edge to pop him out from the black on screen-right. But the fill is all projection. It's subtle but what I loved about it was that it only plays out in that left-most (screen left, that is) part of his face. I lit the key side bright enough that the projection doesn't interfere with it, but only reads in the deepest of the shadows. It plays over much better in the video as the projection moves, but you can still see a bit of the effect in the stills above. And then you have projects where there is no background - the black void interview (or the Apple-style white limbo). These types of setups are hardly my favorite, but sometimes they're necessary. Perhaps the production intends to put text or graphics in the blank space. While it is simpler to not have to worry about lighting or composing a background, there are a number of commonly overlooked elements. You start with your subject and light them (again, you can do any number of things and light them for beauty or for drama). Now what? Just put up a black cloth and shoot? Uh... no (see the photo above - there's a lot going on, lighting-wise). One of the most frequent problems folks have shooting black void stuff is noise in the blacks or, heaven forbid, detail (a wrinkle or fold of the background, or maybe even a shadow). The key for keeping the black black is separation. First, like with most other backgrounds, put as much distance as you can between the subject and the back. A shallow depth of field will take care of all but the worst wrinkles and other sorts of imperfections in the background. Also, the distance will make it easier for you to control your light and keep it from spilling all over your clean black void. Use flags and blackwrap liberally. Lastly another frequent issue - and this is specific to the black void interviews - is lack of separation. Most of the time, you won't want the subject's shape to just melt into the background. To prevent this, you'll want some sort of edge or kicker or hairlight. Framing is also pretty crucial. If you've got a void that won't have graphics or text laid in (see below, left), you want to play your shots on the closer end. This rings more true for shooting 16x9 or wider. If you pull back too wide, you will have a ton of negative space on the eye-side of the frame. When shooting 4:3, it's less of a problem because there's less horizontal frame space, but it's still something to remember.